You've hit the golden years, but it feels more like the Twilight Zone. You receive birthday cards from funeral homes. You need three pairs of glasses to get through the morning paper. Your old friends are dropping like flies. On a good day, nothing hurts until your medication wears off. Well, fear not. You're not alone: senior citizens are the fastest-growing segment of the population. You haven't lost your marbles. You're simply having a few Senior Moments. As a public service comes this book—in large print for your convenience—to reassure you that you haven't gone senile. You're simply experiencing a second childhood. You need three pairs of glasses to get through the morning paper. Your old friends are dropping like flies. On a good day, nothing hurts until your medication wears off. You've hit the golden years, but it feels more like an episode of the Twilight Zone. Well, fear not. You're not alone. Senior citizens are the fastest growing segment of the population. Thirty-nine million Americans are over the age of 65. In fact, someone turns 65 in the United States every fourteen seconds. Like you, they're not too happy about it either -- unless you're overjoyed that you're now entitled to a senior citizen discount on a cup of coffee at McDonald's. Okay, so you can no longer remember your own phone number and you're constantly driving home to the wrong house. You haven't lost your marbles. You're simply having a few Senior Moments. Savor them, treasure them, and above all, get used to them. Experts are projecting that 100th birthday parties are becoming as common as liver spots. You're going to be in this state of confusion for some time to come, so you might as well sit back, relax, and smell the Geritol. 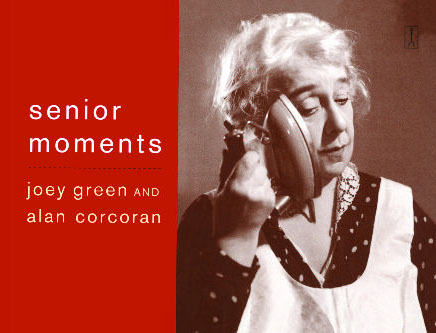 And so, as a public service, we've prepared this checklist of Senior Moments (in large print for your convenience) to reassure you that you haven't gone senile. You're simply experiencing a second childhood. Just be careful. It's a proven fact that too many birthdays can kill you. Joey Green is a former contributing editor to National Lampoon and has convinced Jay Leno to shave with Jif Peanut Butter and Rosie O'Donnell to mousse her hair with Jell-O. Together, he and Alan Corcoran have written several books including You Know You’ve Reached Middle Age If . . . and Senior Moments.